Stargazing at the Sun is incredibly dangerous. You should never look at the Sun directly, even with your naked eyes, and especially not with a telescope or binoculars. If you do, you can easily blind yourself. So how can you observe the Sun safely? The best way is to join a local astronomical society or club and get the members to show you the Sun through their telescopes. So that they can see the Sun safely, these astronomers fit their telescopes with a solar filter that blocks out almost all the Sun’s light, with only a tiny bit getting through. Filters are best fitted at the front of a telescope; you can get filters that go onto the eyepiece, but they can often overheat and crack – and you don’t want that to happen while you’re looking through them! 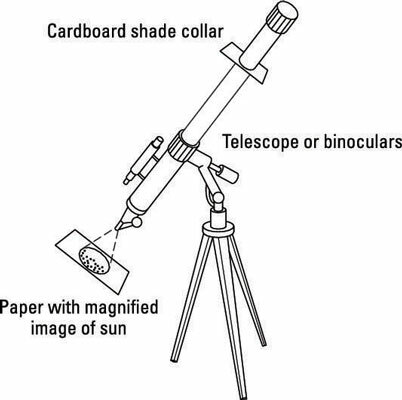 Another good way of observing the Sun is by using a telescope to project an image onto a piece of paper or card, as shown in the figure. If you point a telescope at the Sun, don’t look through the telescope! You can hold a sheet of paper far from the eyepiece and see a round image of the Sun. This works using binoculars too. You can buy specialist telescopes for observing the Sun safely that have built-in filters to block out most of the light. These are great for observing the Sun, but can’t be used for anything else.